Readers need to connect the content to their own lives. Recently I was reading Jane Eyre. The narrator and main character Jane was describing a view of Rochester seated alone in a darkened room, and suddenly I was transported back about ten years and the memory of walking into my father’s office to see him seated at his desk, quiet, lost in thought, came quickly to mind. My father had lost much of his vision, which for a man who loved to read and tinker with electronics in his retirement was tragic. He did not know I had entered, so for just that brief moment I saw how disappointed he was in his situation. One of his hands reached to run fingers over his watch and prompt it to tell him the time. 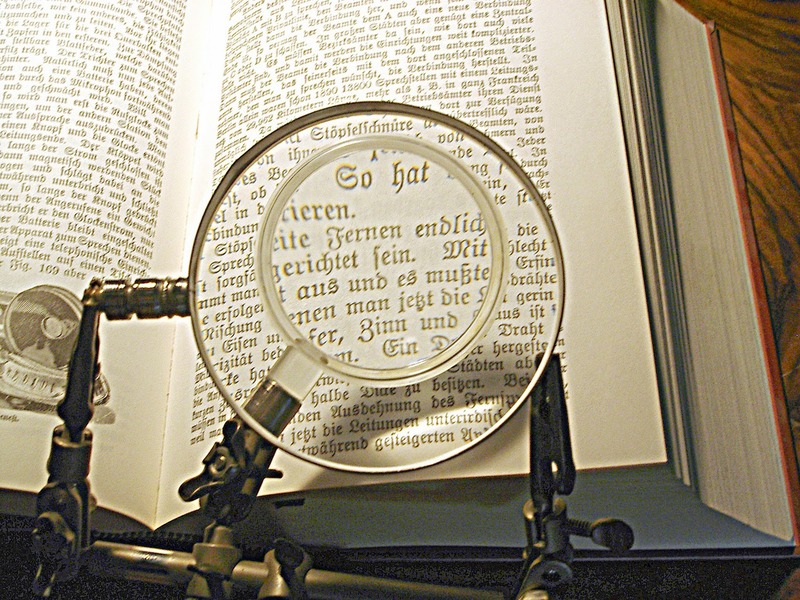 A magnifying glass mounted on an articulating arm was close to his face, and just inches beneath the glass a second magnifying glass hung. Of course, as soon as he was aware I was there, his whole countenance changed to one of pleasure and good cheer. He joked, worked hard to track my movements with his eyes, told me how much I looked like his father, but I knew I was mostly blur for him. His once lovely penmanship was a broken scrawl, and the confidence at which he moved about the house or located things was because he had memorized where everything was and was precise in keeping each to its proper place. Moved by this memory of my father, I could not but be moved by poor Rochester's fate. This is how writers connect their work to their readers. They strike a chord that links to some piece of our lives, one we have or one we wish we had, as well as those we wish we didn't. My beta reader, Marcy Peska, read the first book in my series Students of Jump (In Times Passed). In her notes on my draft, she would comment on what a scene triggered in her or how a piece of dialogue caught her attention. At one point halfway through the novel, she had written in a note "Nooo, I did not see this coming. I have to break away." Then the note continued explaining that she had needed to stop for a "mini-meltdown." Marcy had been immersed in the scene and what occurred had caught her up so emotionally, she could not go on reading without some distance to recover her equilibrium. She loved the scene and hated it at the same time because it had bridged the gap between the text and the imagination. Goal achieved. It was a tough scene to write and tough to read, which was precisely what I was going for. Rochester's injuries had that effect on me. I hated seeing my father that way, but because of the quality of Bronte's writing, I could imagine what Rochester must look like and what Jane must be feeling. The scene was real to me. I had sympathy for both characters, and the scene was authentic because it bridged the two events: fiction and reality. This is the challenge of every writer and the need that every reader wants filled. We want to connect, to find some essence of our own experience that draws us into the scene. The writer must still supply well-written dialogue, description, imagery, finely drawn characters, etc., but what is most vital is that the reader have a way to travel the created moment with a sense of familiarity and originality combined. What work of fiction or biography caught you, the reader, in such a moment? Please share that moment of connectiveness, the author, text scene.